Get answers to common technical questions about the operating system and architecture for Rackspace Private Cloud Powered By OpenStack (RPCO) 14.0. What host operating system does RPCO |release| use? RPCO 14.0 uses and has been tested on Ubuntu 16.04. RPCO uses this version of Ubuntu because of its compatibility with Linux Containers (LXC), Virtual Extensible LAN (VXLAN), and LinuxBridge. What is the recommended minimum number of hosts, and what does each host contain? The recommended minimum number of hosts is five total: four Infrastructure and one Compute, although most production deployments will have many Compute hosts. Using Block Storage will require an additional host. RPCO also requires a hardware load balancer. 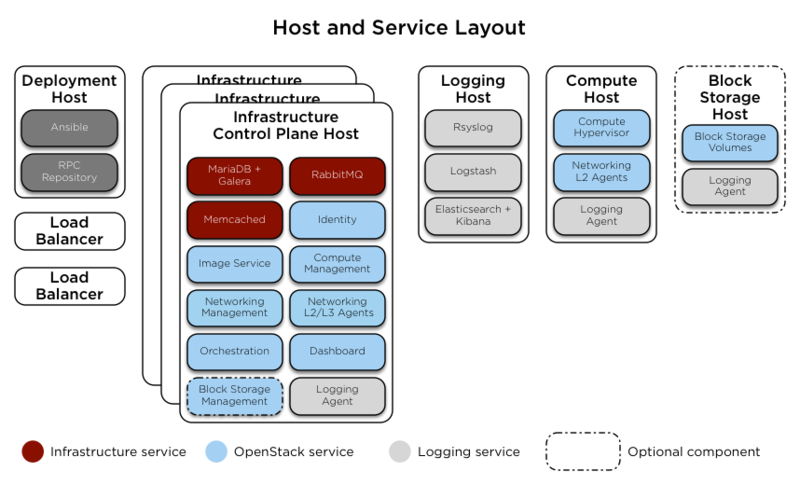 Infrastructure hosts represent both scalable Control Plane hosts and a Logging host. Control Plane hosts contain all of the OpenStack APIs and service requirements such as Galera and RabbitMQ. Logging hosts contain Kibana, ElasticSearch, Rsyslog, and Logstash. Compute hosts contain nova-compute and the neutron-linuxbridge-agent dependent package. Storage hosts contain the cinder volume and scheduler services. Infrastructure nodes can also contain the database services and act as database nodes. How is node scaling accomplished? Build a new node with Ubuntu 16.04. Add the node to the hosts group in the rpc_user_config.yml file. Run the required playbooks to assign the necessary roles to the node. The neutron-linuxbridge-agent service scales out with the Compute containers. Otherwise, services do not need to be scaled together. Do any of the services have scaling limits? There is no known limit. What is the maximum number of each service that can be deployed within a single environment? There is no known maximum. However, each node should have only one nova-compute and one cinder-volume container. Neutron services with a strong relationship to other services are limited by those other services. For example, because the neutron-linuxbridge-agent is associated with nova-compute, each node has one of those agents. RPCO 14.0 is based on the OpenStack Newton release. By default, OSA deploys cinder-volumes on physical hosts (is_metal: true parameter) instead of in a container. Users must migrate their volumes if cinder backups switch to physical hosts from containers. For more information, see the cinder-migrate section in the RPCO upgrade guide. What advantages does Ansible provide as a deployment method over Chef? Although Chef is a useful deployment method in many circumstances, the Ansible automation framework excels at deploying the RPCO container-based architecture and managing source code across multiple hosts. In addition, Ansible does not require any agents and is resource efficient, and the configuration methodology is easy to understand. The OpenStack-Ansible deployment process has become the reference Ansible deployment model for OpenStack. What advantages does LXC provide in the context of OpenStack deployment? LXC is stable and well-supported. Containers enable separation of host management from OpenStack management, and enable management of individual OpenStack components and configuration files. Does RPCO support Telemetry service (ceilometer)? At this time, RPCO does not support the Telemetry service because of stability, scalability, and performance issues. What options do customers have for the Image service (glance) in a customer data center? Provide Rackspace with an NFS mount point. Add the Object Storage (swift) service to act as the Image Storage back end. Create a Ceph object store. What options do customers have for the Image service (glance) in a Rackspace data center? Use Cloud Files. Note that a Cloud Files back end may experience additional latency when retrieving or storing images, depending on the customer's location. Use Red Hat Cluster Suite (RHCS) NFS. Add the Object Storage (swift) service to act as the Image service back end. Can I list the instances that are backed by a given image in the Image service? No, there are no native tools to do this. However, RPCO support created the image_check.py utility script that traverses all active instances and checks for deleted, orphaned, or mismatched images. The script works for all versions of RPCO. Run the script from the utility container. In RPCO 14.0, SQL query access to the database on the Galera container is restricted to local queries. Therefore, for RPCO 14.0 run image_check.py from within the Galera container. Can I find out which glance image my server instance depends on? The expected output contains the name and hexadecimal ID of the glance backing image. How do I determine if a specific commit for a bug is running in an upstream OpenStack Installation? Record the SHA of the commit, which is 9ff5bb967105451a1c3c1a6dbeb0ec979afaeb in this example. The seven character entry that appears last on the line is the SHA of the commit used to build neutron in this OpenStack installation. How do I recover from an Infrastructure node loss, and reattach the node to the cluster? A manual procedure resets and reattaches the service or cluster inside the Infrastructure node. In the following example, the procedure restores a RabbitMQ cluster to the infrastructure nodes following a service failure.